Follow-ups allows administrators to manage all lesson schedules associated with their trainees. Here, administrators can perform actions such as rescheduling a lesson for a trainee, cancelling a lesson schedule, manually completing the lesson scheduled for a trainee and sending reminder emails to one or many trainees as required. Supervisors of a group will have access to the follow-ups page with permission to perform all actions that an administrator has, while restricted only to trainees that they supervise. Follow-ups page give an administrator complete control over lesson schedules. An administrator can check the progress of the lesson, number of reminders that were sent, lesson status (Due, Overdue) and also if the lesson was manually or automatically scheduled for that user. Each row in the page defines all of the above properties. 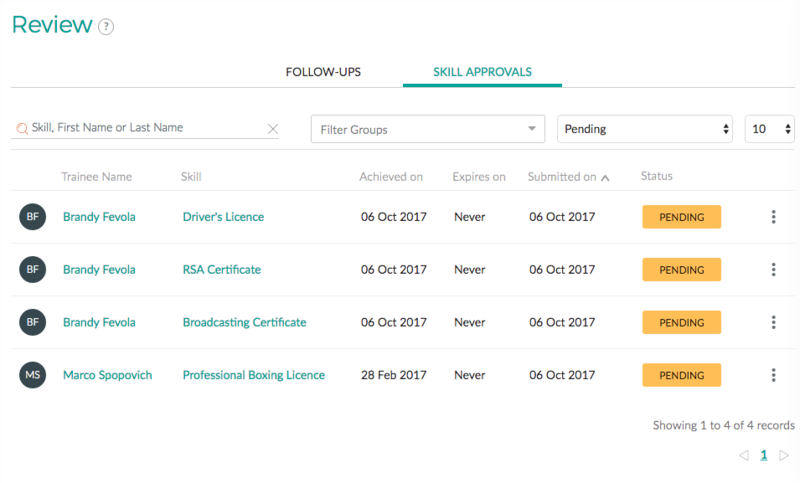 Skill approvals are a part of the Skill Self Service features that allow supervisors and/or administrators to approve trainee submitted Skills. To approve a skill select the options button at the end of the row and select "Approve"